Energy is given high priority in the national development agendas of most Small Island Developing States (SIDS) because it is intertwined with social, economic and environmental challenges. Many SIDS experience heavy fiscal burdens associated with imported fuels, some have very low electricity access rates, and islands also have a strong interest in the transition to cleaner energy because they are particularly vulnerable to the impacts of climate change. This paper presents a global mapping of development finance for SIDS’ energy sectors. We analyse whether energy aid has increased following international commitments to support developing countries tackle climate change and whether this is supporting renewable energy, whether finance has been targeted to different recipient countries based on either their income status or their electricity access rates and whether electricity access rates have substantially improved during this time, and whether financial commitments are actually being disbursed. Focusing mainly on the period 2002–2016, we use data reported by bilateral and multilateral sources to the Organisation of Economic Cooperation and Development’s Development Assistance Committee on financial support to 37 SIDS. Our analysis includes almost 5700 energy-related transactions between 2002 and 2016. Data on populations and electricity access rates of individual countries come from the World Bank’s Open Data platform. We observe an increase in funding since 2009 and a shift towards renewables, and solar particularly, though oil-fired plants and other non-renewables continue to be funded. Energy aid is unevenly spread between SIDS, on a total and a per capita basis. There is little correlation between the allocations made to individual countries and either their income or energy access gaps, and improvements in electricity access have been slow in those countries where the gap is largest. We also identify low disbursement rates, suggesting implementation problems. There is an urgent need to improve the quantity and quality of aid to help SIDS tackle their significant energy challenges. While the trend towards more funding for renewables is positive, low disbursement levels and limited support for strengthening local human and institutional capacities may be limiting its effectiveness. Among the many challenges that governments and communities in Small Island Developing States (SIDS) have to manage is access to, and the cost burdens of, energy. Most SIDS rely heavily on imported fossil fuels, mainly oil, for electricity generation and primary energy supply, as well as for transport , a situation that creates direct financial burdens, supply risks and indirect costs associated with climate change. High and potentially volatile fuel prices, high transport costs in the energy supply chain and inefficient use in diesel generators mean SIDS tend to suffer from higher electricity costs than other countries [2–4]. Fossil fuels also create a drain on government budgets and current accounts; fuel imports in the Pacific region are worth on average around 10% of gross domestic product (GDP) , a salient fact given that SIDS are among the most indebted countries in the world . Some estimates suggest SIDS globally would save around $3.3 billion annually if they switched all energy to renewable sources, equivalent on average to around 3.3% of their GDP though some countries could achieve much higher percentage savings, especially in the Pacific and Indian Oceans . SIDS give high priority to the energy sector in their national development plans, in their Nationally Determined Contributions (NDCs) submitted to the United Nations Framework Convention on Climate Change (UNFCCC)  and in joint declarations like the Samoa Pathway . The Samoa Pathway highlights access to affordable, modern energy services, renewable energy and energy efficiency as key elements of SIDS sustainable development strategies. These priorities mirror those of the Sustainable Development Goals (SDGs), specifically SDG7, under the United Nations’ Agenda 2030 . SIDS tend to have high renewable resource potentials relative to energy demand, particularly wind and solar resources . Many have shown strong interest in introducing cleaner, more financially sustainable options particularly for electricity generation, driven by both economic and risk considerations . Some have adopted targets for scaling up renewable energy that are at the most ambitious end of the spectrum globally —the Cook Islands, Cape Verde, Fiji, Saint Vincent and the Grenadines, Vanuatu and Samoa all aim to increase the share of renewable energy in their power mix to between 60 and 100%. Addressing SIDS energy challenges is no easy task. A wide range of barriers have been cited: lack of information and awareness [1, 12, 13]; high costs and lack of suitable financing [1, 3, 11–15] including limited financial services in some countries; the absence of supportive regulatory frameworks such as rules that make it difficult for utilities to undertake grid extensions in rural areas, or the presence of poorly designed subsidies that keep energy prices artificially low and discourage investment [1, 3, 11–14, 16]; small energy markets which constrain the establishment of independent regulatory agencies that can be crucial to the development of new policy measures that will support energy investment ; resistance by incumbent—usually state-owned—power companies to new technologies [1, 11, 17]; limited technical capacity for working with new sources of energy including renewables [3, 14, 18]; lack of negotiating capacity ; low financial transparency and sustainability of utilities ; lack of long-term planning and political commitments , mirrored by the short-term horizons of international donors ; weak regional coordination, particularly noted in the case of African SIDS ; and in some cases, the need for social or cultural changes in order to switch energy sources or technologies [16, 18]. The International Renewable Energy Agency (IRENA)  stresses access to finance as a critical issue that has constrained the ability of SIDS to expand renewable energy, noting insufficient local equity and government funding. Renewables also pose a different kind of financing challenge in that the main costs are driven by significant upfront capital investment, compared to fossil fuel-based power systems where fuel consumption is the main cost and is spread over the asset’s operating life and in some SIDS may require strengthened transmission systems. IRENA  also finds that around three quarters of the SIDS they surveyed are not budgeting for the long-term operation and maintenance of renewable energy projects funded by donors. These barriers constrain private investment, and as a result, the public sector, and particularly international development finance, has been heavily relied upon for expanding and maintaining energy assets and for financing energy imports [16, 22–24]. Some suggest that publicly financed energy systems are not necessarily a bad thing in SIDS because foreign financial interest in energy assets would otherwise result in capital outflows from their economies that could be particularly damaging due to the high ratio of electricity consumption as a share of GDP in some countries . This reliance on external aid creates its own challenges. One is that technology choices are often made by donors and are not necessarily compatible with local needs or expectations , and Dornan  suggests off-grid rural electrification projects implemented by donors and governments have rarely been sustainable. It has also been noted that although donors and other regional and international organisations emphasise policy development, for renewables, for instance, the same organisations often do not follow the policies when making critical funding decisions . Keeley  highlights concerns about the high volume of aid eroding the commercial characteristics of renewable energy applications and effectively making it harder for the private sector to play a role, thus reinforcing a dependence on public finance in future. Hemstock and Smith  describe lock-in effects such as where donors fund diesel generators and then, in future years, target their aid at budget relief in order to offset the high costs of importing fuel to run the generators. 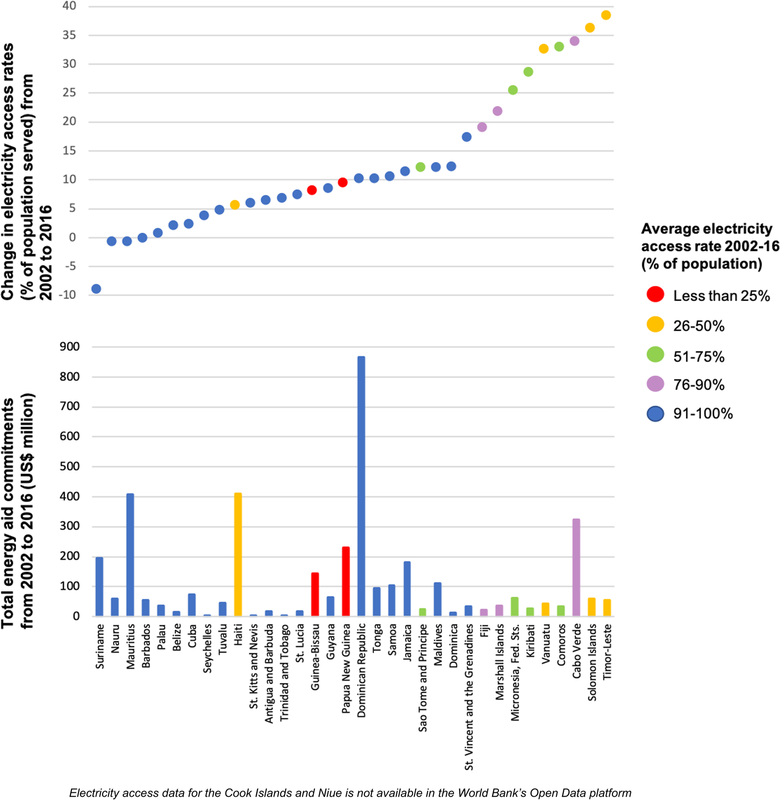 Dornan and Shah  note that aid has preferentially targeted grid-based renewable energy projects over rural electrification or cleaner cooking programmes, even in countries like Vanuatu and Papua New Guinea where energy access rates remain very low by world standards. One review of sustainable energy initiatives in countries (not SIDS) where energy access deficits are greatest finds low levels of disbursement of energy commitments by donors and attributes this to legal and contractual issues at the country level, technical difficulties in executing projects and donor-side delays related to loan agreements . Over the last decade, international financial support for particularly renewable energy and energy efficiency has been increasing globally , partly because of commitments made under the UNFCCC to help developing countries tackle climate change [28, 29]. Declarations like the Samoa Pathway have reiterated calls for international partners to maintain and extend this support to help SIDS pursue their energy access and clean energy agendas. The significance of SIDS’ energy challenges and the increasing flows of financial aid for clean energy globally lead us to be interested in questions about what energy-related aid is being provided to SIDS and what effects it is having. There has been relatively little analysis published of what energy aid these countries have received over recent decades, particularly for renewable energy . Most analysis has focused on the Pacific [12, 18, 22], or the Caribbean and Pacific jointly [19, 23]. A further study  summarises finance from the Asian Development Bank (ADB) in the energy sector in Asia and the Pacific, which includes the region’s SIDS but does not address them specifically. This literature offers some insights into the character of energy aid. A growing emphasis by donors on targeting aid towards reforming energy policy and on institutional technical assistance is widely highlighted [11, 12, 30]. Another common finding is that grid-based electricity has received considerably more funding than off-grid energy [11, 12]. Keeley  finds that since 1970, around 80% of renewables funding in the Pacific went to hydro projects—and is consequently concentrated in a small number of countries which have the potential for hydropower—though notes a recent trend towards more solar projects. Niles  examines finance from the multilateral development banks, which tends to be less concessional than Official Development Assistance (ODA), and finds that more than 89% and 97% of energy assistance has been provided as debt in the Pacific and Caribbean SIDS respectively. Around half of renewables finance to the Pacific from 1970 to 2014 was provided as loans, though this picture is skewed by large hydro projects; other renewables have mostly been targeted with grants . Despite disbursement challenges , some analysis has concluded that aid has positively affected capital formation in the energy sector in SIDS . In this paper, we provide an updated and more comprehensive mapping of development finance for energy activities in SIDS globally. Using data reported to the Organisation for Economic Cooperation and Development (OECD) Development Assistance Committee (DAC) by countries, multilateral funds and development banks, we examine the following questions: whether volumes of finance for SIDS’ energy sectors have increased following UNFCCC commitments; whether aid is responding to the global energy transition needed to tackle climate change and to SIDS’ own emphasis of renewable energy; what financial instruments have been used to deliver this support; whether aid is targeting the most needy in terms of energy access gaps (specifically, electricity access) and, related, whether it has catalysed improvements in access rates; who is providing energy aid for SIDS; and, the ratio of disbursements of aid relative to commitments, as a proxy for identifying potential implementation challenges. The analysis is focused on mapping development aid to SIDS’ energy sectors during the last 15 years from 2002 to 2016. This covers a period when we would expect to see increased financial flows to clean energy following commitments under the UNFCCC. For historical context, it begins by showing data from 1973 (when the first data is available). Even though the data quality is not comprehensive prior to the early 1990s, it offers useful context prior to focusing our analysis on more recent trends over the last 15 years. Our analysis covers 37 SIDS globally.1 Seven are from the African and Indian Ocean region, and fifteen from each of the Caribbean and Pacific regions. Thirty-five are UN-member states (we exclude Singapore, Bahrain and Bahamas because they are high-income countries) and the remaining two—the Cook Islands and Niue—are independent sovereign states which are members of the regional governing bodies for the Pacific even though they do not have the same UN status. Apart from the Cook Islands and Niue, we exclude the other eighteen non-UN SIDS members from our analysis because they are overseas territories of France, the Netherlands, the UK or the USA, and the financial support they receive is linked with these relationships. We include data on finance reported to countries and also regional contributions, where these are reported separately for the Caribbean (‘West Indies’ in the CRS) and Pacific (‘Oceania’). Each transaction recorded in the CRS database is linked with a ‘sector’ and a ‘purpose’ (which is a sub-sector, for example a type of energy). Our analysis includes all transactions that were coded under the sectors: energy policy; energy generation (renewable sources); energy generation (non-renewable sources); energy distribution; hybrid energy plants; and nuclear energy plants (DAC sector codes 231 to 236). We do not include energy-related interventions in the transport sector because the CRS database does not distinguish these from other transport sector activities. In total, we find almost 5700 transactions with energy sector codes between 2002 and 2016. Note that one project on the ground may consist of multiple, separately reported transactions in the database. The finance amounts in our analysis are presented in constant 2014 prices, as recommended by the OECD DAC4 to account for inflation and exchange rate fluctuations. Some donors have reported loan repayments as a negative disbursement in the CRS database, meaning it appears in the same column as actual disbursements from donors to recipients. Therefore, prior to our analysis, we removed all negative disbursement amounts from the data. Additional data used in our analysis, specifically on populations and electricity access rates of individual countries, are taken from the World Bank’s Open Data platform . The CRS data has some significant limitations. Some non-OECD sources of finance are not included in the database, such as China which is a notable gap because recent analysis shows China to be a significant financier in the Pacific islands at least . An important qualification is that the data is reported by donor organisations and is not validated by recipients. Another is the possibility of mis-coding by sector. For instance, some energy-related support may have been coded by donors under ‘General Environment Protection’ or the ‘Multi-sector’ code, and if so, these transactions are not in our analysis. There is also evidence of errors in data entry (e.g. very low figures that are unlikely to be correct) or missing data, which we assume these to be the product of incomplete or erroneous reporting. In our analysis, we take all commitments and disbursements at face value as they are reported. The CRS data is incomplete prior to 1990, offering only a partial picture of global aid. This has no substantial effect on our analysis, since we focus primarily on the period 2002 to 2016; the exception to this is the snapshot provided in Fig. 1, which we include despite the incomplete coverage in early years because we consider an historical picture still provides useful context for our subsequent focus on more recent trends. Finally, before 2015, the CRS did not include a separate Purpose code for ‘energy conservation and demand side efficiency’ until 2015. This means we cannot separately identify finance for this objective in earlier years. From 2002 to 2016 inclusive, total energy aid commitments to SIDS were US$4128 million. Before diving more deeply into this period, Fig. 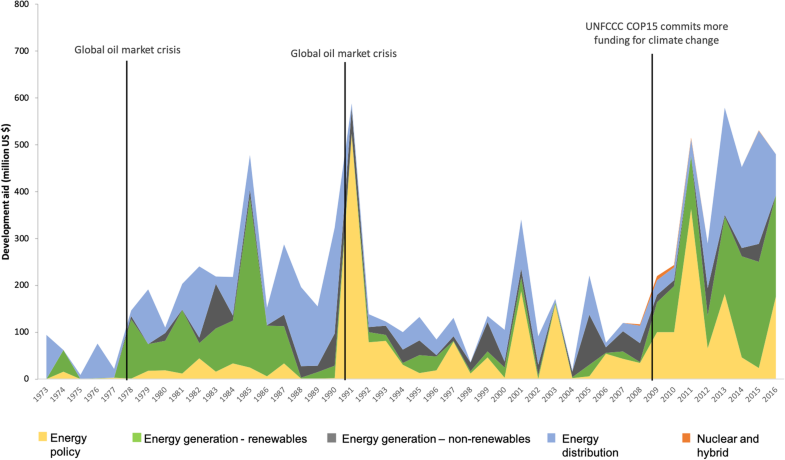 1 provides some historical perspective by representing total energy-related donor commitments aggregated for all SIDS annually since the 1970s. Although the coverage of data prior to 1990 is incomplete, the figure nonetheless illustrates that there have been several sharp and unsustained peaks in energy aid. Some sharp changes in the level of funding at different points in time may be correlated anecdotally with changes in the international context. The first increase visible in the figure in 1978–1979 coincides with a global energy crisis triggered by extremely high world oil prices. Another spike in funding around 1990–1991 coincides with another global oil crisis precipitated by the Iraqi invasion of Kuwait in August 1990. However, on closer inspection of the data, this large spike in 1991 consists mainly of two large finance packages from the Inter-American Development Bank, for Jamaica and Trinidad and Tobago respectively, rather than a pattern of expanded energy support to SIDS generally. In fact, immediately after this spike in the years 1992 to 1998, energy-related aid actually declined to its lowest levels in over two decades. The figure also shows that the last 10 years has seen the strongest sustained financial support for the energy sector. Beginning around 2007, a clear upward trend in energy sector support is visible, and a stronger focus on renewables, with a more rapid increase from around 2010. This trend comes immediately after Parties to the UNFCCC committed to provide increased climate finance to developing countries at COP13 in Bali (2007) and made more specific finance commitments at COP15 in Copenhagen (2009). Support for renewables and energy distribution increased significantly from around 2013. Funding for fossil fuel-based energy continues and over the 2002 to 2016 period has on average been relatively steady, even if annual figures fluctuate. The increase in finance over the last decade reflects an increase in the volume of aid overall and also a greater emphasis on energy issues within aid portfolios. Total aid commitments to SIDS—including not only the energy sector—rose from US$2.55 billion in 2002 to a peak of US$10.86 billion in 2010, and from 2011 onwards stabilised around US$7–8 billion per year. Between 2002 and 2010, the energy sector received an average of 3% of development finance flows to SIDS, whereas from 2011 to 2016, the average increases rapidly to 7%. Figure 2 breaks down the US$4128 million of energy-related aid to SIDS during the 2002 to 2016 period into different energy sectors. When renewable and non-renewable generation are combined, ‘energy generation’ has received the most funding overall. In total, renewables have received more than three times the amount of funding commitments than non-renewables over these 15 years. Significant funding has also been targeted to ‘energy policy’ and to ‘distribution’. The ‘energy policy’ component is misleading, because a closer look at the data shows that donors have reported a wide variety of projects in this category, including some that are clearly electricity generation projects. Support for power transmission and distribution has been heavily concentrated in the Caribbean. In all regions, finance for transmission and distribution tends to be concentrated in a few large investments, and thus commitments spike in individual years rather than spread evenly over time. From 2002 to 2016, US$1.23 billion was committed to renewables. Figure 3 shows negligible renewables funding prior to 2009, but a dramatic change from 2009 onwards, after which renewables support has exceeded support for non-renewables in every year except 2012. This reflects large increases in funding for solar energy particularly. Over this period, commitments to solar energy (US$281 million) surpassed commitments to hydro projects which were previously the largest share of renewables. Most of this targeted the Pacific (US$207 million) compared with the Caribbean (US$39 million) and African and Indian Ocean (US$59 million) regions. Support for solar has been unevenly spread between countries. Nine SIDS actually received no finance for solar energy (unless funds were channelled through programs reported by donors using the ‘regional’ codes rather than annotated for individual countries). These are Antigua and Barbuda, Barbados, Papua New Guinea, Saint Kitts and Nevis, Saint Lucia, Saint Vincent and the Grenadines, the Seychelles, Suriname, and Trinidad and Tobago. A further eight received less than US$1 million. The Maldives and Cook Islands were by far the largest recipients of aid for solar (US$50 million and US$47 million, respectively). Wind energy did not receive significant support, in total only US$31.5 million. The largest wind commitments were in the Caribbean (US$22 million), with very little focus in the Pacific (US$9 million). Wind has been supported in only eight countries: Cabo Verde, Cuba, Dominican Republic, Grenada, Jamaica, Micronesia, Saint Kitts and Nevis, and Samoa. However, the largest of these commitments is only US$9 million, in Jamaica. In Cabo Verde, Cuba and St Kitts and Nevis, the commitments are less than US$1 million. Such small amounts suggest development aid has perhaps been used for background studies or preparatory work but not for any large-scale investments in wind power (unless it has played a minor role in enabling larger commercially funded projects, which is not determinable from the CRS data). Some funding for geothermal energy materialised in 2016, the largest of which are projects in the Caribbean funded by the Green Climate Fund and by the United Arab Emirates. Very few commitments target biofuel-fired power plants and more than half are for activities in Mauritius. 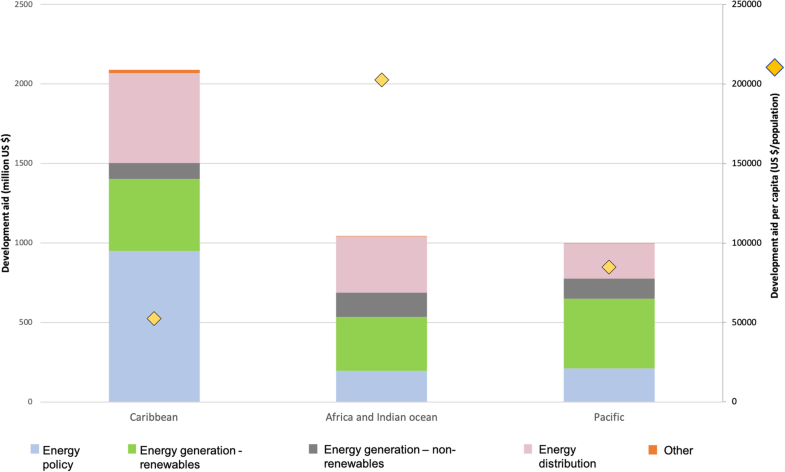 Note that renewables commitments to the African and Indian Ocean SIDS have been coded by donors mainly using the ‘multiple technologies’ category, which masks what kinds of technologies have been employed in this region. Non-renewables investment totalled US$386 million. The largest recipient was Cabo Verde (US$107 million), followed by the Dominican Republic and Samoa. Figure 3 shows oil-fired power plants receive funding consistently throughout the period (US$188 million), most likely for maintenance or refurbishment of old plants which provide the only grid supply of electricity in some countries. By far the largest share of this went to the Pacific (US$108 million). In 2016, the annual funding commitments are relatively evenly split between grants, concessional loans and OOF, as indicated in Fig. 4. Since 2012, grants have declined in overall importance (not necessarily in overall amounts) while OOF has slightly increased in significance. As a share of total funding, and in absolute volume, renewables have received the highest amount of grant funding. 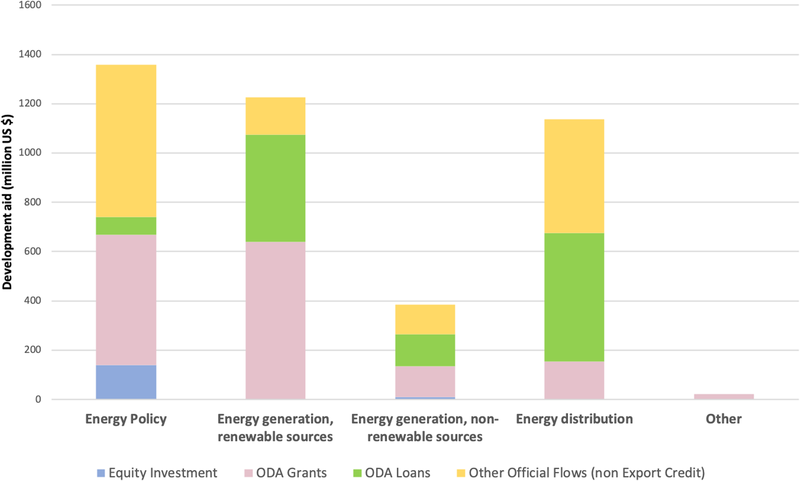 By contrast, energy distribution has been funded mostly via ODA loans and OOF. For SIDS classified, as of March 2018, as least developed countries (LDCs), nearly 70% of the total energy funding they were approved was in the form of grants, with the remainder as ODA loans. Overall, the data shows very little equity has been available to the energy sector via ODA or OOF, and this is only in 2003 and 2005. This suggests either recipient governments or the private sector—or possibly the MDBs through other capital contributions not reported to the CRS—are providing the equity needed for energy investments. The reported equity is mostly coded under ‘energy policy’ but appears actually to be a handful of investments in national power companies in the Caribbean. The single largest equity contribution, from the UK to Mauritius in 2003, is cryptically described in the database, so it is unclear what this was for. 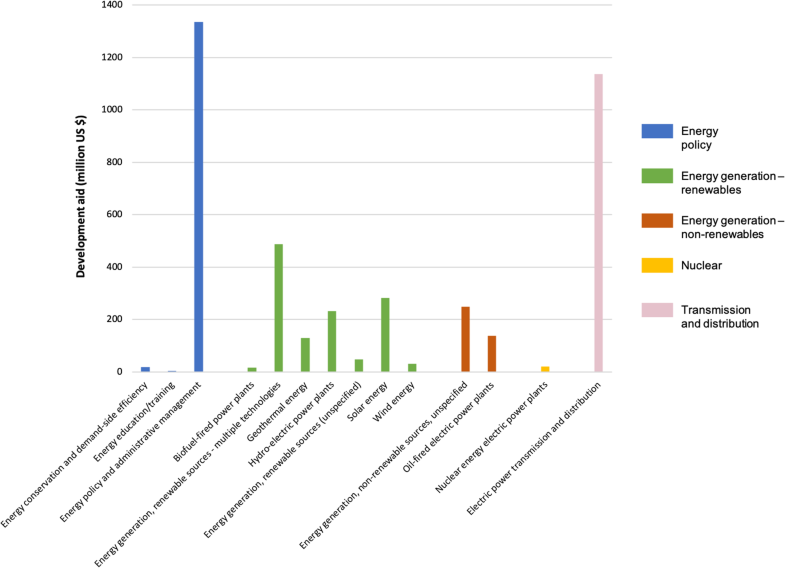 Figure 4 highlights the important role grant funding has played for renewables, more so than for other sector codes. 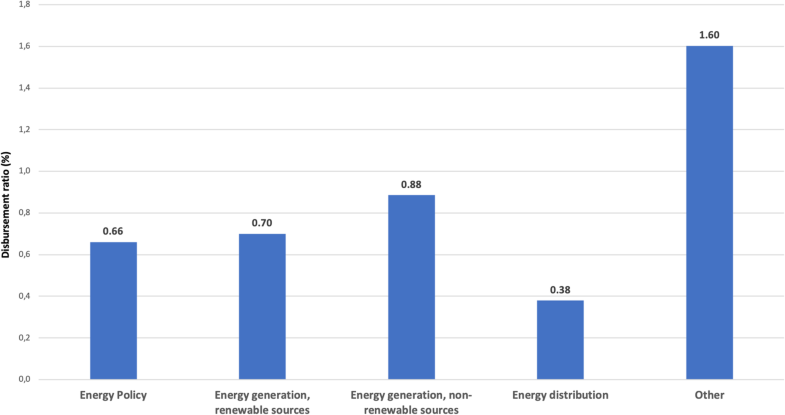 The less concessional flows provided as OOF appear to target mainly energy distribution and energy policy, although as above, the energy policy category includes a lot of generation activities which are a more likely target for the more commercially-oriented flows of OOF. The same applies for the equity commitments reported under energy policy; these are actually not for policy support (which would make little sense for equity) but rather for generation. Between 2002 and 2016, the total figure of US$4128 million in commitments to energy activities in SIDS is heavily skewed by large amounts to a few recipients. The top four recipient countries—Dominican Republic, Mauritius, Haiti and Cabo Verde—account for about half of the total commitments during the period of the analysis, and almost half of this was concentrated in the Dominican Republic. Figure 5 breaks down energy aid by region. The Caribbean, which has most countries and the largest population, received the greatest share by volume. The figure also breaks down this support according to the sub-sector targeted (using CRS Purpose Codes). As mentioned, the ‘energy policy’ code is used misleadingly by reporters to the CRS; the large chunk coded as energy policy in the Caribbean includes activities relating to generation, energy efficiency, capacity building, and policy and administrative support. The figure also shows per capita commitments to each region, which we calculate using population data from the World Bank for 2016.5 On this score, African and Indian Ocean SIDS have on average received by far the largest commitments (US$203 k per capita over 15 years) compared with the Pacific (US$85 k per capita) and Caribbean (US$52 k per capita). However, average per capita commitments at a regional level are distorted by commitments to their most populous countries. Therefore, in Fig. 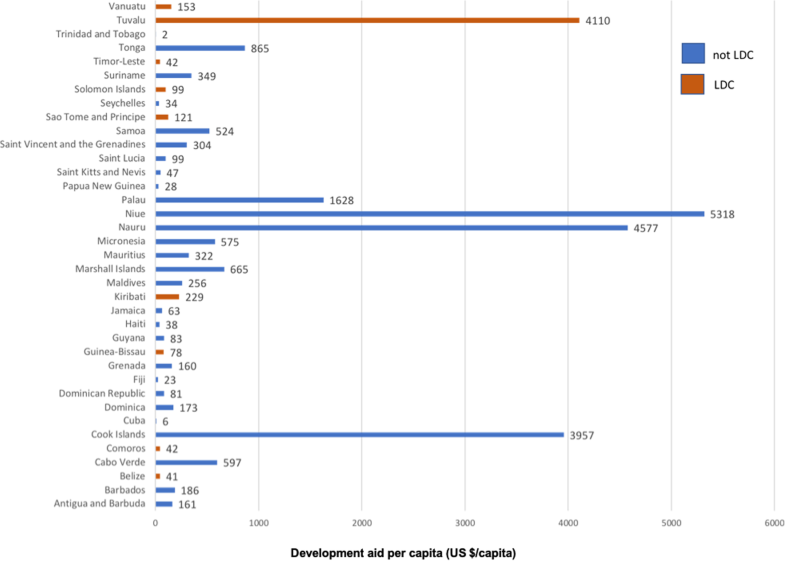 6, we show per capita energy aid for each SIDS country. The difference between the highest and lowest amounts spans four orders of magnitude. Nine of the ten highest recipients are actually Pacific islands, while the Pacific regional average is lowered by the fact its most populous countries, Papua New Guinea and Fiji, are at the lower end of the spectrum. Figure 6 also distinguishes (by colour) those SIDS that are, as of March 2018, classified as LDCs. With the exception of Tuvalu at the upper end of the spectrum, the other LDCs are around the middle of the per capita range, meaning the LDCs have not received more funding per capita than the other SIDS. Figure 7 pairs energy aid commitments with country-level electricity access statistics from the World Bank’s Open Data platform. Average electricity access rates in each country over the period 2002 to 2016 are shown in percentiles, by colour. Overall, SIDS with the lowest electricity access rates are not receiving more energy-related aid than other SIDS. The two countries with the lowest electricity access rates, Guinea Bissau and Papua New Guinea, are towards the upper end of the spectrum in total energy aid commitments, but both are at the lower end in commitments per capita (Fig. 6). Of the other four countries which have electricity access rates below 50%, only Haiti is among the highest energy aid recipients in total amounts, but again, Haiti’s per capita figure is at the lower end of the spectrum. Timor Leste, Solomon Islands and Vanuatu are on the lower side of the spectrum in terms of total commitments for energy, and Timor Leste is also low on the per capita spectrum. The data suggests some countries with relatively low electricity access rates have achieved gains since 2002. In Fig. 7, changes in electricity access rates over the period 2002 to 2016 are plotted against the upper y-axis. Timor Leste, the Solomon Islands, Cabo Verde and Comoros have achieved the most significant improvements, increasing coverage to an additional 30–40% of the population over the last 15 years. These gains were achieved despite these countries being towards the lower end of the spectrum for receiving energy aid on a per capita basis (and with the exception of Cabo Verde, also in total commitments). Kiribati and Vanuatu too have improved electricity access by over 25% during the period. The Dominican Republic—which received more than double the commitments of the next highest recipient in our analysis—achieved for the first time in 2016 an electricity access rate of 100%, having improved from 89% in 2002. The data also highlights some cases where progress has been relatively limited. The countries at the left side of Fig. 7 are those experiencing the lowest improvement in access rates, though most of these are at or close to 100%, so there is little progress to be made on this front. However, in Suriname, electricity access has gone backwards, dropping from 96% in 2002 to 87% in 2016, despite being towards the upper-middle of the spectrum in terms of per capita commitments of energy aid and the sixth highest overall in total finance terms. Haiti only expanded access to an additional 5.7% of the population over the 15 years and reached only 39% by 2016. Papua New Guinea expanded by 9.5% but electricity access remained at a very low 23% in 2016. The lowest electricity access figure among all SIDS in 2016 was 14% in Guinea Bissau, and this is after an improvement of only 8% over 15 years. Another of the LDCs, Sao Tome and Principe, remains at 65% in 2016 and has made relatively slow progress, improving 12%. Figure 8 shows the main providers of energy aid in each of the SIDS regions. Knowing who the donors are is important because these entities effectively influence the norms and policy frameworks as much as material investments that shape SIDS energy sectors. The largest shares were committed by the multilateral development banks. The World Bank has played a large role, via the International Bank for Reconstruction and Development (IBRD) in the Caribbean and via the International Development Association (IDA)—a part of the Bank that focuses specifically on the world’s poorest countries—in the African and Indian Ocean region. The regional development banks—ADB, the African Development Bank (AfDB) and Inter-American Development Bank (IADB)—have all been important sources in their respective geographies. Japan is the largest bilateral source of energy finance and has focused on the Pacific and Africa and the Indian Ocean regions. Other important bilateral partners have been the United Arab Emirates (Pacific and Caribbean), New Zealand (Pacific), the USA (Caribbean), the UK and France (Africa and Indian Ocean) and European Union Institutions (mainly in the Pacific). The most important finance sources for renewable energy have been the IADB, the ADB, the European Union and Japan. The ADB has worked on the generation side almost exclusively with renewables, while it has also prioritised transmission and distribution. The AfDB has targeted mainly transmission and distribution activities. The largest providers of finance for non-renewable energy generation have been the IBRD, Japan and France. In the sections above, all values shown and discussed are the amounts committed (i.e. approved) by donors; however, this rarely reflects what actually ends up being spent. Looking also at disbursement data tells us whether aid commitments are actually materialising on the ground. We use the term ‘disbursement ratio’ to refer to the total volume of disbursements as a portion of the total volume of commitments during the same period. A large difference between commitments and disbursements (i.e. a low disbursement ratio) might indicate that there are implementation challenges. Changes in the disbursement ratio over time provide insight into whether the actors involved—donors and recipients—are learning and becoming more effective at project design and implementation. Figure 9 shows disbursement ratios aggregated for all SIDS between 2002 and 2016. It presents 3-year averages, in order to look at whether disbursement ratios have changed over time. It also compares these average disbursement ratios in the energy sector with ratios for all development aid to SIDS (i.e. not only in the energy sector). The figure reveals two important patterns. First, disbursement ratios in the energy sector are not increasing over time, as we might expect if the funding entities and project developers are getting better at implementing energy projects. In fact, disbursement ratios for energy have steadily declined since 2005–2007, which contrasts with improving disbursement ratios for all aid over the period. Second, disbursement ratios in the energy sector are consistently lower than those for total development aid. Figure 9 also shows the number of energy projects recorded in the CRS database each year has steadily increased between 2002 and 2016, more or less tripling. The number of projects was compiled by collating transactions that used the same project identification number in the CRS as a single ‘project’, which means the number of individual transactions is considerably higher than this. This dramatic increase in the number of activities might be creating absorption problems for recipient countries, particularly since many SIDS rely on relatively small public sectors to manage and implement this increasing volume of aid projects. Disbursement ratios in the different SIDS regions are relatively similar, although the African and Indian Ocean region has a slightly lower ratio (54% average over the period 2002 to 2016) than the Pacific (63%) and Caribbean (66%) regions. Projects in the LDCs appear more difficult to execute because these SIDS have an average disbursement ratio of 66% between 2002 and 2016, compared with 86% in non-LDC SIDS. Comparing aggregated disbursement ratios with other developing countries (non-SIDS), the data indicates that since 2011 the disbursement ratios for energy activities in non-SIDS have been comparable with those for SIDS. There is significant variation in disbursement ratios for different types of energy projects, as shown in Fig. 10. Over the period, non-renewable projects have a high average disbursement rate of 88%, suggesting donors, project developers and recipients are familiar with, and have the expertise necessary to execute, these projects. This compares with an average ratio of 70% for renewables projects. Projects targeting energy distribution have a much lower ratio of 38%, indicating some significant difficulties in implementation. Previous literature on energy aid to SIDS has been sparse, and we are aware of no other studies which have looked at this for SIDS on a global scale. This paper provides a first comprehensive analysis of energy aid to all SIDS and an updated analysis to previous regional studies [12, 18, 22, 23]. 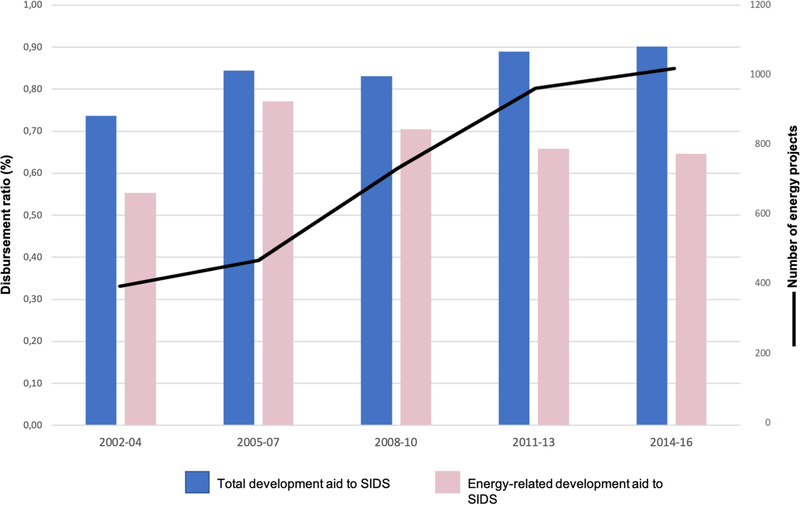 Based on data reported to the OECD DAC by donors, funds and development banks, the volume of energy aid to SIDS appears to have increased particularly from 2009 onwards. However, if we exclude the commitments to the largest recipient, the Dominican Republic, average commitments of aid for energy over the 15 years from 2002 to 2016 were US$5.9 million per country per year. If we also exclude Mauritius, Haiti and Cabo Verde, each SIDS was committed on average US$3.8 million per year for energy activities. For a capital-intensive sector like energy, these are relatively small amounts with which to catalyse meaningful change in the types, coverage and reliability of energy. Energy aid does appear to be supporting a shift towards cleaner energy sources. The trend towards renewables is important from a climate perspective but also because, if it displaces oil imports, this could improve energy security and reduce fiscal pressures for SIDS. There appears a growing appetite among donors and recipient countries for expansion of solar energy, also noted previously [12, 27]. As it is nearly a decade since this surge in solar investments began, now would be a good time to take stock of how these projects have fared from a technical and financial perspective. It is also important to understand whether the early projects have contributed to a gradual scaling up in size and ambition for solar projects, or to a diversity of applications. By contrast, the fact very limited support has been provided for the development of wind power is to us a surprise, especially since some SIDS have plentiful wind resources. The reason for this is not evident from the finance data but would be valuable to explore further. Some donors including the IBRD, France and Japan are still providing significant sums of aid for non-renewable energy projects. In the near term, it may be difficult to completely shift away from any support for non-renewable energy, given that many SIDS are still reliant on diesel-based power stations for electricity and that transitioning from these to cleaner energy takes time. The data suggests that donors and finance institutions have not strategically targeted their energy aid towards those countries with the greatest electricity access gaps. This echoes findings by a study of energy finance from the World Bank which concludes that energy access is rarely a motivating factor in project selection . Moreover, across all SIDS, our findings suggest mixed effectiveness of aid in improving electricity access and little correlation between the amounts of energy aid provided and improvements in electricity access. In 2016, electricity access figures among several of the SIDS remain very low: Guinea Bissau is at 14% and Papua New Guinea at 23%. A lack of progress also stands out in Haiti, which has seen little improvement even from a low base. Meanwhile, five of the nine LDCs expanded electricity access to a further 25% or more of their populations in these 15 years, and LDCs actually make up five of the seven most improved countries in our analysis. It would be instructive to better understand what countries like Timor Leste, Comoros and the Solomon Islands have done to help achieve what looks like substantial progress relative to their SIDS peers. What ‘looks like substantial progress’ is, however, relative and remains vastly inadequate. Despite gains, the LDCs and some other SIDS still suffer large energy access deficits that need urgent attention if the goal agreed under the UN of achieving universal energy access by 2030 is to be met. Four of the nine countries with the lowest electricity access rates have improved coverage at less than 1% per year. Even those SIDS having made most progress have achieved change at 2–3% per year, which given the size of the electricity access deficits these countries still face makes the 2030 target look facetious. At current rates of progress, Guinea Bissau might achieve universal electricity access in 156 years, Haiti in 161 years and Papua New Guinea in 122 years. One reason for such limited progress is suggested in the disbursements data. Those disbursement ratios for energy aid are lower than for total (non-energy) aid and show a declining trend over recent years is indicative of implementation problems in this sector, though the data does not tell us what these problems are. A previous study  finds similar disbursement challenges in energy aid in Africa and Asia (not SIDS) and identifies some general explanations which may also be useful to examine in SIDS, including political issues, donor and recipient bureaucracy, and weak human capacity. Transmission and distribution (T&D) projects appear to be particularly challenging to implement, which is problematic because many SIDS emphasise reducing losses and expanding grid access as critical goals. In most SIDS, T&D investment and planning is the responsibility of state-owned, vertically integrated utilities, so low disbursement rates in T&D points at possible institutional problems within these utilities. We observe that the LDCs have a significantly lower average disbursement ratio than countries that are not LDCs, which might be the result of institutional weaknesses such as capacity gaps in the public sector or inadequate cost recovery mechanisms in local electricity markets. However, for comparison, we also note that energy projects in other countries (not SIDS) have similar disbursement ratios, suggesting the problem may be to do with the sector and the nature of the activities themselves rather than the recipient countries. Regardless of the cause, low disbursement rates mean missed investment and a wasted opportunity for SIDS to pursue their energy objectives and could have a stagnating effect on other sustainable development goals. Encouraging greater coordination between funders might help reduce transaction costs, since the proliferation of energy projects appears to be having a negative effect on absorption capacities. However, the ability of SIDS governments to bring disparate donor funding together into larger programmes relies on having strong institutions that can coordinate across government and negotiate with donors, and previous literature suggests many SIDS already struggle with this. A previous study  has identified several ‘success factors’ behind the expansion of renewable energy programmes in some Pacific SIDS, including clear policy targets and action plans, effective regulation, and a financially sound electricity utility. Another study  has suggested that donors commonly do not spend aid in line with national policies even where these do exist. A final observation is that donors have spent virtually nothing on energy education and training (or at least have not coded support to this objective in the CRS). If the data is accurate, this is a significant gap in light of previous findings that capacity to manage especially renewable energy in the grid is limited and constrains expansion of clean energy [3, 14, 18] and that training and institutional strengthening are critical for the long-term sustainability of the renewable energy sector in SIDS . It is worth noting that if supply options shift towards micro-grids and/or household generation, which seems particularly relevant for remote rural populations, energy access and grid connectivity may in future become increasingly decoupled; a trend towards off-grid projects by donors has previously been noted in the Pacific islands . Overall, this paper adds an updated and global view of what is happening in the energy aid space for SIDS. The CRS data is helpful in seeing financing patterns at a relatively coarse level, even though there are problems with the data quality including errors in coding that distort the picture, as described in the ‘Data limitations’ section. But mapping energy aid is only a first step, albeit an important one, in understanding the effectiveness of development finance. It provides a platform for further research evaluating the success of SIDS and their development partners in addressing energy-related challenges, since this is fundamental to the broader sustainable development agendas of small islands. Our results show the scale of development assistance is small compared to SIDS’ overall energy financing needs; however, we recognise other sources of finance are also involved and will also be critical to future investments. Further research can help complete the picture of where finance is coming from for energy investments in SIDS, for instance by looking at the roles being played by countries’ own national development banks and the private sector. One global study finds private investment for renewable energy has mostly (93%) remained within the country of origin . For SIDS, this suggests that efforts to mobilise domestic private capital might be needed. Stronger involvement by private capital implies, in turn, an important regulatory role for governments to create enabling environments that can mobilise funding and to manage the distributional costs and benefits of future energy investments. There is a critical need for more analysis of the outcomes and impacts of aid in SIDS, including its contribution to long-term energy transition pathways, its effectiveness in addressing access gaps and high costs and evaluation of the technical and financial sustainability of the solutions being implemented. In our analysis, we only looked at electricity access rates but not other relevant metrics for aid effectiveness, like changes in electricity costs, energy system reliability, the fiscal burden of energy or the environmental sustainability of SIDS energy systems. These would also be interesting to examine in future research, especially for those SIDS where energy access rates are already high and therefore access is presumably not the focus of current aid programs. Finally, in evaluating energy aid’s contribution to the sustainable development agenda, it would be valuable to see future work examine who bears the costs of new energy projects, since different energy choices imply an uneven distribution of costs and benefits. It could also examine the types of innovation in public policy that might ensure clean energy is rolled out efficiently and equitably and that it enhances livelihoods for the poorest without creating new financial burdens. International development finance remains a critical resource for island states. Its effectiveness in funding material improvements in energy access, costs and sustainability will influence the broader sustainable development agendas of small island communities. To this end, more finance and more effective use of these funds are required to tackle SIDS energy challenges. Funding for this study was provided from the Swedish International Development Agency, Sida, to the Stockholm Environment Institute. All authors have collaboratively contributed to all phases of the research and in the development of the manuscript. Both authors read and approved the final manuscript.